A state economist said it simply. This tragic event will not likely devastate the state's economy. "Minnesota's GDP is about $250 billion a year. This loss, while it will be significant for some individual firms, is not going to have a major impact," said state economist Tom Stinson. There are a number of alternate ways across the Mississippi River, Stinson said. That means while it's inconvenient, the effect of the bridge collapse is reduced for many who depend on shipped goods. That said, trucking firms see a financial headache for some time. John Hausladen, president of the Minnesota Truckers Association, said about 4,800 trucks used the route that included the I-35W bridge. Studies by the association in 2000 concluded losing that span would mean $120,000 a day in added operational costs to divert trucks to other routes. "If you think about any freight that moves north of the metro (area) straight south -- that's pretty much the lane it has to go down," Hausladen warned. "Right now truck traffic is pretty much restricted on route I-35E, and that was due to when it was built and some concessions were made to the neighborhood. So if you want to drive from Duluth south with a load of paper, that's the route." Hausladen said his association will seek some relief by petitioning Gov. Pawlenty to temporarily rescind the restrictions on truck traffic on I-35E through St. Paul. Relief for barge haulers along the river will not come until the debris from the bridge collapse is cleared away. Steve Lenhart, area lockmaster for the U.S. Army Corps of Engineers, said there really isn't a good model to use, since the only other bridge collapse was 17 years ago when a portion of the Lake St. bridge fell into the river. 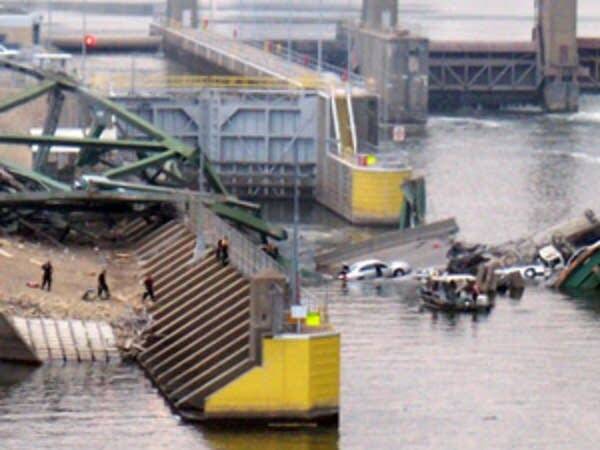 "Just remember back to the Lake Street bridge, when that collapsed," Lenhart said. "We were out of business for a couple of weeks. This is a bigger bridge, more steel involved than concrete. It depends on the recovery of vehicles and the investigation that's ongoing." Lenhart said this portion of the river, at the Minneapolis port, accommodates a much smaller amount of freight from barges. With capacity for only two barges there, about 1.5 million to two million tons of goods are sent by barge through the lock in the vicinity of the collapse. That's much smaller when compared to the 11 million to 18 million tons of goods handled on other portions of the river. Train freight will hardly be affected. Officials at the Minnesota Commercial Railway, which owns the line underneath the collapsed bridge, say the few cars that use the line can easily be diverted. The real economic loss of the collapse, said economist Tom Stinson, comes from what he called the hidden costs. "There is going to be additional commuting time for commuters," Stinson said. "That's not going to reduce their consumption. It is going to reduce the time they have available to do other tasks and other leisure activities." Stinson said it will be difficult to know now what those costs will add up to be. Michael Caputo has 18 years of experience in daily newsrooms in radio, television and newspapers, mainly as a political reporter.